The Hovawart is a very old German working breed. It is a yard and farm watchdog. The breed was nearly lost in the early 20th Century. 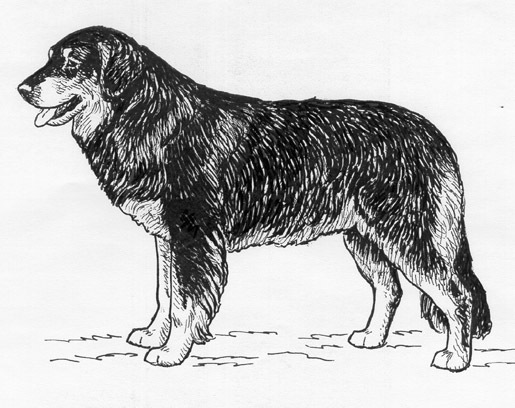 Breeding was restored by using dogs of the old type that were found on farms, and crossing them with German Shepherds, Newfoundlands and Leonbergers, among others, and selecting for dogs that were of the original working type. 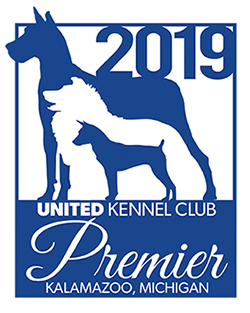 The Hovawart was recognized by the United Kennel Club July 1, 1996. The Hovawart is a medium sized, powerful, long coated working dog. The breed is very versatile, being useful as a watch, guard, tracking and rescue dog, as well as making an excellent companion. The males are larger and more massive than the females. Kind and even in disposition, the Hovawart is devoted to its family and has a natural protective instinct. The head is powerful, with the skull and muzzle of approximately the same length and tight fitting skin. Broad, with a rounded forehead. There is a marked stop. The muzzle is strong and tapers only slightly to the tip when viewed from the top or the side. The nasal bone is straight and the lips are tight fitting. The Hovawart has a complete set of evenly spaced, white teeth meeting in a scissors or level bite. Disqualifications: Undershot, overshot, or wry mouth. The nose has well developed nostrils. It is black in color, though a snow nose is acceptable. Oval in shape, with tight-fitting rims. Varying shades of brown in color. The triangular, drop ears are loose fitting and set on high, giving the impression of broadening the skull. In length, they reach to the corners of the mouth. When the dog is alert, they may be carried slightly forward. Medium length, strong, without dewlap. The shoulder blade and upper arm are long and well laid back. The upper arm fits closely to the body. Strong, straight and vertical, with elbows fitting close to the chest. The pastern is moderately sloping. In proportion, the Hovawart is longer than tall by 10-15 percent. The chest is broad and deep. The back is straight and firm. The loin is strong and fairly long, and the croup is medium long and slightly sloping. The upper and lower thighs are very well muscled and the hocks are well let down. Fairly round and compact, with well arched toes. Dewclaws should be removed except in those countries where it is prohibited by law. The tail is long, reaching to below the hock joint, but not all the way to the ground. It is well covered in bushy hair. It is carried low in repose and high and curved over the back when the dog is alert. Long, dense, close and slightly wavy. There is not much undercoat. The coat is short on the face and the fronts of the legs, longer on the chest, belly, back of legs and tail. The skin is tight fitting and has a bluish sheen in the black and black/gold dogs and a mostly pink sheen in blond dogs. Disqualification: Distinctly curled (ringed) coat. The coat is black and shiny, the colour of the markings medium blond. On the head, the markings begin below the nasal bridge and extend round the corners of the mouth into the marking of the throat. The point-shaped markings above the eyes are clearly visible. The chest markings consist of two adjacent patches which may be connected. On the forelegs, the marking, seen from the side, extends from the toes to about the pastern and tapers off on the rear side at about elbow level. On the hind legs, seen from the side, the marking below the hock is seen as a broad stripe, above the hock only as a narrow stripe which extends on the front side of the hind leg up to the level of the belly. A marking is also present beneath the set on of the tail. The markings are distinct in outline everywhere. Single small white spots on the chest, as well as some single white hairs on toes and tip of tail, are permissible. Black pigmentation on eyelids, lips and pads. The coat is black and shiny. Some single white spots on the chest, as well as some single white hairs on toes and tip of tail, are permissible. Black pigmentation on eyelids, lips and pads. The coat is medium blond, shiny and becomes lighter towards legs and belly. Single small white spots on the chest, as well as some single white hairs on toes and tip of tail, are permissible. Black pigmentation on eyelids, lips and pads. Disqualification: Any color or combination of colors other than those described. Height for males ranges from 25-27½ inches. For females, 23-25½ inches. The Hovawart moves in a straight line in a very extended, ground covering trot. There is powerful drive from the hindquarters. Under the acceptable height range. More than one inch over the acceptable height range. Undershot, overshot, or wry mouth. Any color or combination of colors other than those described.